Discover this superb semi-professional kitchen renovation project in a residence in LaSalle. You too can benefit from our expertise as a general contractor in residential renovation and our turnkey kitchen renovation service. Call us today for a free consultation! 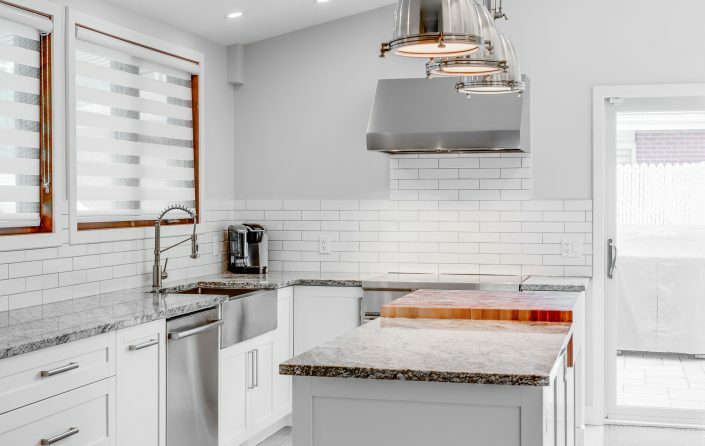 We had the chance to work on a wonderful kitchen renovation project for a newly moved-in couple who wanted to give a prestigious and practical touch. 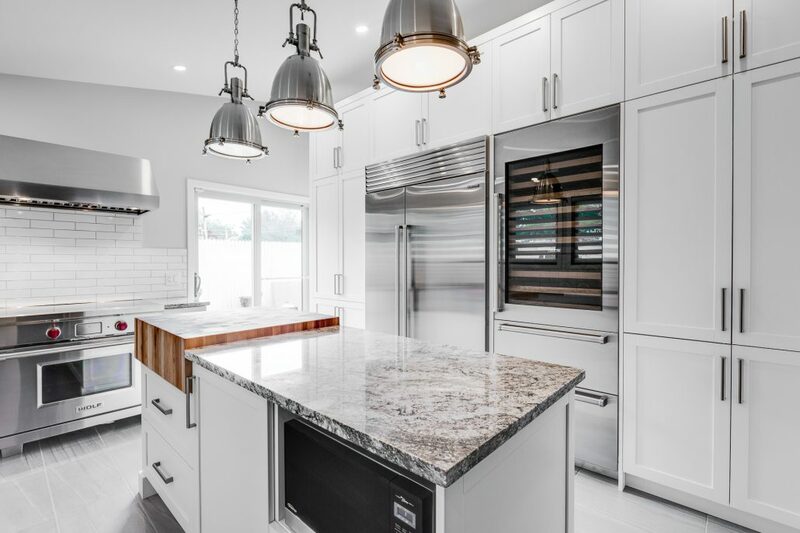 Our kitchen designer spent time with our clients to better define their needs and offer them a contemporary style kitchen with a small industrial touch. First, we removed the old linoleum floor and replaced it with a ceramic floor. Then, we completely redid the counters to add storage with custom cabinets, and a granite countertop covering. Customers chose a stainless steel sink with a faucet and integrated hand shower. Subsequently, we had a custom kitchen island built with granite siding and butcher’s block. Underneath the island are cabinets, drawers and a space for the microwave oven. 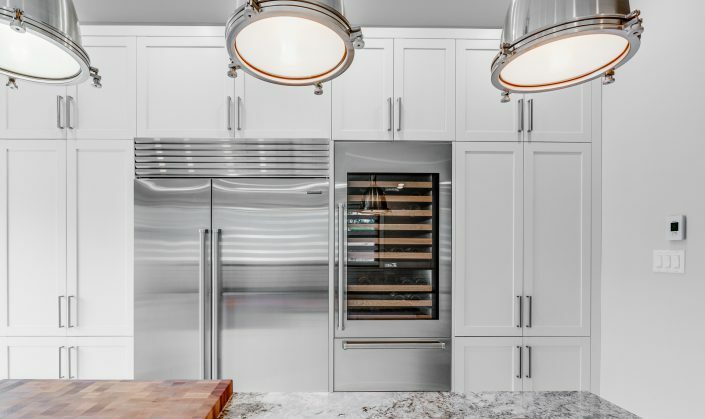 All appliances (dishwasher, side-by-side refrigerator with double door, kitchen hood) are finished in stainless steel for a more modern and industrial look. We opted for a semi-professional electric stove with integrated oven, in stainless steel finish. 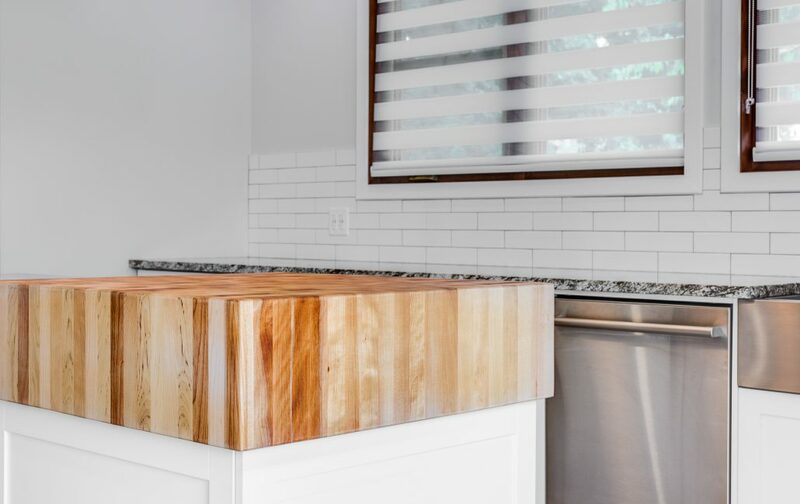 All wooden kitchen cabinets have been custom made to customer specifications. 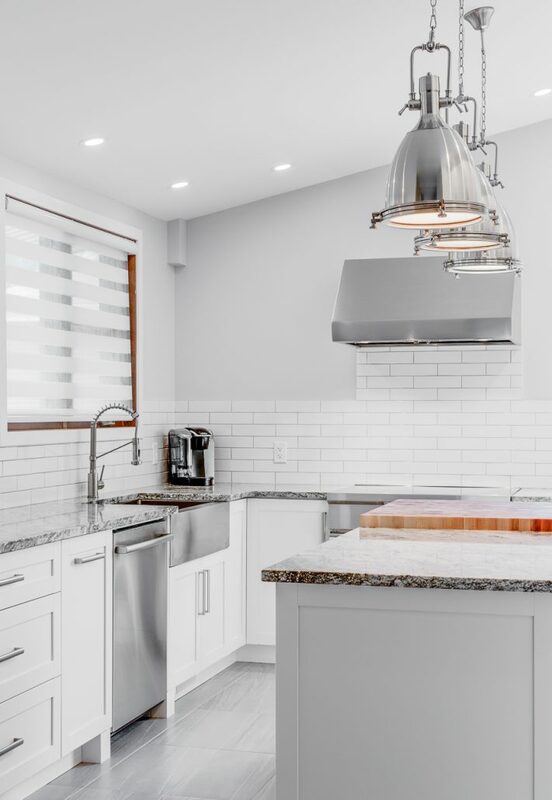 Above the island, we have chosen suspended lamps with a stainless steel finish for a modern and industrial look. 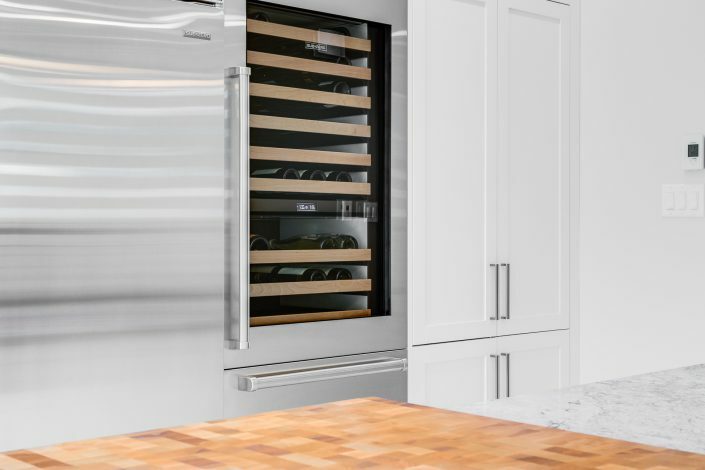 As a luxury accessory, we have also added a two-zone cellar to meet the needs of our customers. 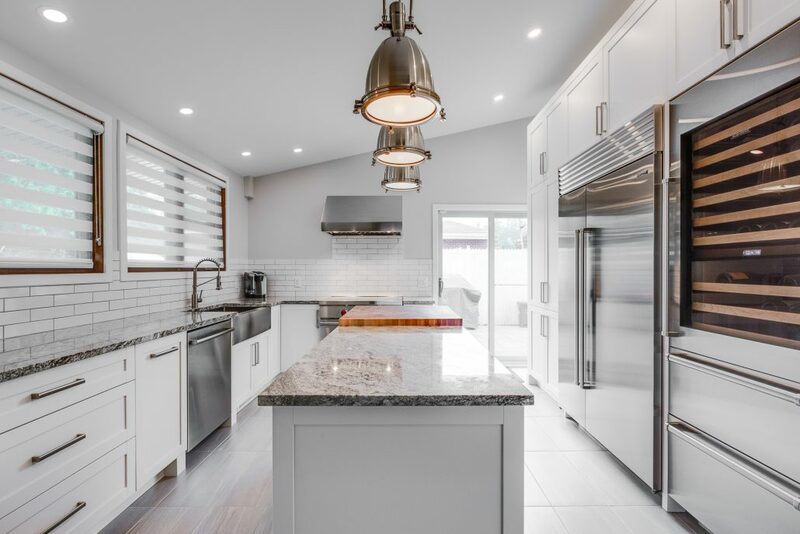 The result is a luxurious, semi-professional kitchen, practical and modern, with bright and sober tones. 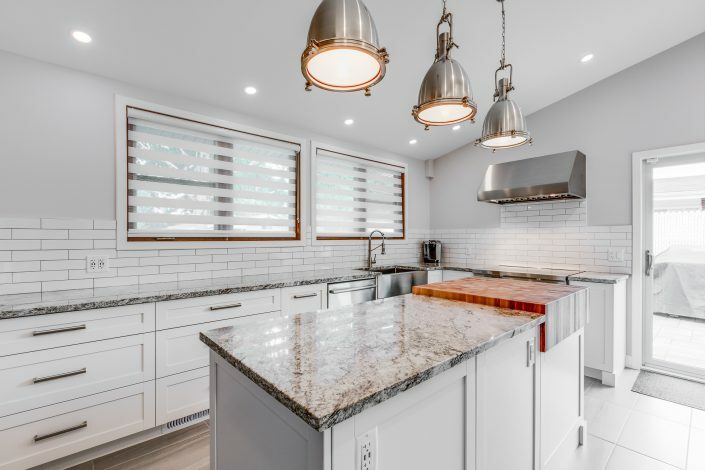 As a general contractor specialized in kitchen renovation, we have established long-term partnerships with interior designers, cabinet and kitchen countertop manufacturers, electricians, plumbers, etc. This approach allows us to carry out any kitchen renovation project, regardless of its size and duration. 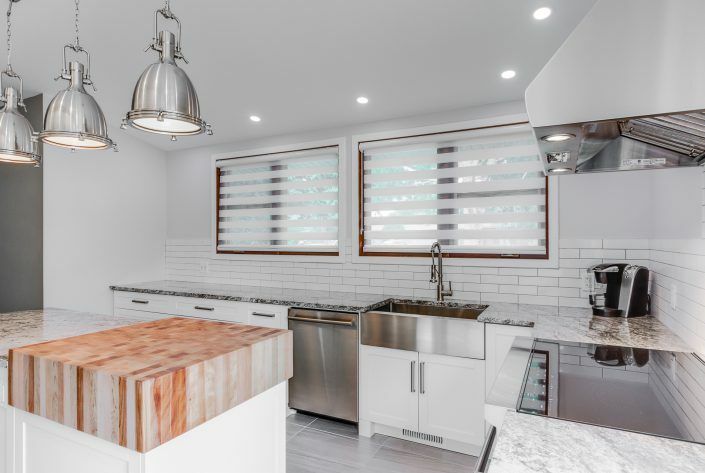 If you would like to know more about this semi-professional kitchen renovation project, our turnkey residential renovation services, our prices, or our services, we invite you to contact us by email or phone. Your first consultation is free of charge! Our team will be happy to welcome you and answer your questions.